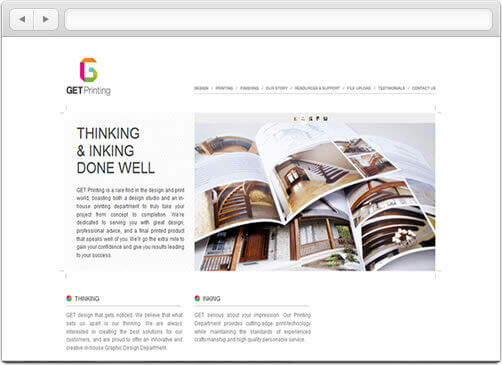 Client Case Study: GET Printing Ltd.
News - WebWiz@rd 3.0 Officially Released!! Now that you have the list of Keywords you want to be found by, click here to read part 2 where I discuss Meta- Tags, and how to use the Meta-Tag module in WebWiz@rd. As graphic designers and printers working together under one roof GET Printing is obsessed with great visual communication - be it online, or on paper. We obsess over the little details from start to finish – it’s what sets our work apart. It’s these subtle details done well that win our clients’ trust and helps bring them success. REM “gets it”, and that makes us a great fit. We required a web site that could really sell who we are without sacrificing any functionality. Being innovators who get the job done, we really wanted our web site to sell this idea. Our design department knew what they wanted the site to communicate visually, and our printing department knew the nuts and bolts of the work that our site would need to be able to do for our print clients. REM stepped up to the plate and delivered the attractive look we envisioned coupled with the practical functions necessary for our printing clientele. REM gave us great initial training, and whenever we’ve needed help while making updates to our site their support has been timely and top-notch. REM won’t just get you started and leave you stranded. We really feel they’ve got our backs covered. We enjoy working with them and would highly recommend their services to you. Be sure to contact GET Printing for advice and a quote before you start your next printing or design project. We’d love to help. Until the end of 2012, mention that you’re a REM client and you’ll receive a 20% discount off of our design services! Design customers will also be gifted 250 free business cards. We are very happy to announce that the new version of WebWiz@rd is now officially released! We are very excited about this new and improved version! We know you will agree that it is the easiest Content Management system you will ever use! Stay tuned for more information in the coming months.